Hope everyone is having a great week! 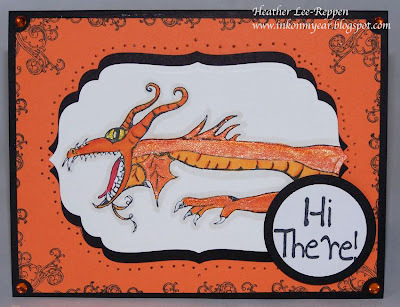 Today I thought I would share one of the cards that I made using this awesome dragon stamp from the "She Dreams" stamp set from Firecracker Designs. I absolute LOVE this dragon. I colored the dragon with Copic markers and then painted areas with Shimmerz Marigold paint. It gives the perfect amount of shine on the dragon. Oh! The Shimmerz are just perfect for this image! Love it! Shimmerz really makes him pop.